We are a Registered Investment Advisor founded in 1963 and based in Los Angeles, CA with offices throughout the country. Our Investment Management Team combines Fully Invested and Tactical strategies to build Institutional Client portfolios using ETF’s, stocks, fixed income, cash and cash equivalents. Since inception of the firm, our experienced Investment Management Team has defined the market cycle into three, distinct periods with the goal of maximizing opportunities and minimizing risk for the long-term Institutional Investor. How We Help Institutional Investors? 1. Institutional Clients may choose from a menu of fully invested and tactical equity strategies, along with fixed income, to best create a unique blend catered to reaching Client goals. 2. Markets are forever cyclical. We aim to help our Clients capture alpha during the downside of the market. What differentiates Churchill Management Group from other advisors is that when risks are high, we can take action to preserve capital. Our tactical disciplines allow for movement away from equities into cash or cash equivalents in perceived high risk periods. Conversely, when investment risk is low, we aim to capitalize by identifying growth opportunities in equity leadership within our tactical strategies. 3. Founded in 1963, our team of investment professionals has over 150 years of market insight and portfolio management experience. Churchill Management Group created its disciplines during the secular bear markets of the 1960s and 1970s and it has been time tested throughout numerous cycles over the many years. 5. Our proprietary process of reviewing market indicators builds conviction in making well informed, disciplined, investment decisions. Our Investment Management Team thoroughly reviews market conditions for its tactical strategies using Sentiment, Fundamental and Technical Indicators to build Client portfolios. 6. Our Institutional Client Service Team adheres to a well-defined communication plan based on client expectations and needs. Whether it be monthly or quarterly meetings, customized reporting, or frequent access to Portfolio Managers (formally or informally), our team is well-prepared to make our clients feel comfortable and well informed at all times. *Performance can be provided upon request. Identifying high and low risk cycles of the market is critical to preserving gains while aiming to minimize market loss. Our Institutional Clients appreciate this investment style as well. We believe that the stock market cannot just be defined into a BULL and BEAR phase. Rather, we assess market cycles into three distinct periods: The Red (downside), The White (bottoming with lower risk) and The Blue (high risk phase). We aim to mitigate risk throughout the cycle by using specific tactical strategies and complementing them with a fully invested component. Churchill Management operates both Tactical and Fully Invested Strategies to address institutional portfolio needs. We have been using Top Down Sentiment, Fundamental and Technical indicators to interpret market cycles with the primary goal of determining high and low risk points when investing in our Tactical Strategies. We utilize our Bottom Up research to best identify market leadership in both our Tactical and Fully Invested Strategies. Our Portfolio Management Team has been using proprietary approaches since our inception in 1963. Our objective within our Tactical Strategies is to mitigate investment risk by reducing exposure during high risk periods and optimizing performance during low risk periods in the market. By complementing this goal with a fully invested approach, which aims to participate even during high risk topping periods in the market, we can best achieve our Institutional Clients’ goals. Premier Wealth Tactical Core’s discipline is to first determine the strategic Top Down allocation of ETF’s and cash equivalents. 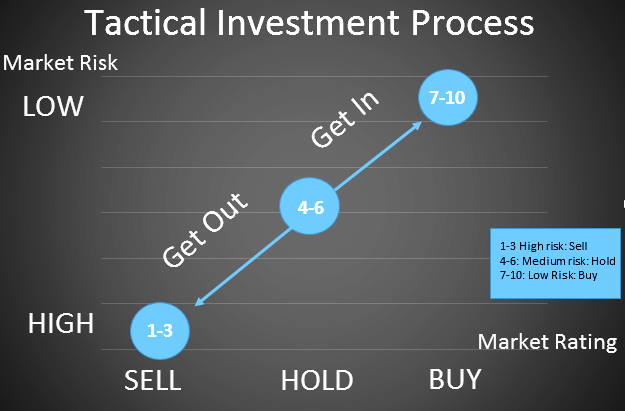 Once the proper amount of exposure to the market has been determined, a Bottom Up approach is used to determine which individual equities should be purchased. The percentage of the strategy invested in the stock market may vary substantially depending on Churchill’s judgment as to the prevailing risk in the market. When Churchill believes risks in the stock market are low, Churchill will increase the exposure to equities to attempt to take advantage of growth opportunities. When Churchill believes risks in the stock market are high, all of or a portion of the equity exposure may be moved to more stable short-term fixed income instruments and cash equivalent alternatives in order to protect capital. Premier Wealth Tactical Core will invest in exchange traded funds, domestic or foreign, that Churchill believes have the potential for significant price increases and will not purchase individual stocks. Note, other mutual funds could be purchased within these strategies if it is considered to be in the best interest of the client due to account size or to acquire money market alternatives. ETF Sector Rotation’s philosophy is that certain sectors in the market tend to out-perform and under-perform for prolonged periods of time. The Investment Management Team believes we can achieve superior returns by aiming to invest in the out-performing and often under-weighted sectors of the market. ETF Sector Rotation may initially purchase an exchange traded fund (ETF) that is comprised of all equities on the S&P 500. Once Churchill has identified specific sectors in the S&P 500 that it believes have the potential to outperform the S&P 500, Churchill may sell a portion of or all of the this ETF to overweight the account in those sectors by purchasing sector specific ETFs. The Investment Management Team uses a variety of technical and fundamental indicators to identify the sectors that Churchill believes will exhibit the potential for significant price appreciation versus the overall market. While ETF Sector Rotation is typically fully invested and subject to market risk, certain sectors will be employed as defensive positions with the aim of outperforming the index in down markets. Based on a Client’s needs, individual goals, and chosen allocation, Churchill may also invest a portion of the account in various stylistic ETFs (i.e. large cap, growth) and International ETFs (Emerging and International Markets) consistent with Churchill’s analysis of the market. In smaller accounts CMG may choose to solely purchase and stay invested in ETFs not normally purchased in Sector Rotation that invest in macro market indices despite client’s strategy selection until such time as the account grows to a level making managing in the selected strategy appropriate. Furthermore, a client may choose to combine various allocations of Premier Wealth Tactical Core and ETF Sector Rotation within one account. Based on a Client’s needs, individual goals, and chosen allocation, Churchill may also invest a portion of the account in various stylistic ETFs (i.e. large cap, growth) and International ETFs (Emerging and International Markets) consistent with Churchill’s analysis of the market. Furthermore, our Institutional Clients may choose to combine various allocations of Premier Wealth Tactical Core and ETF Sector Rotation. The Equity Dividend Income strategy is designed for Clients seeking to combine income from individual stocks with their potential for growth. The strategy seeks to put together a fully invested equity portfolio with a well-diversified group of high quality stocks paying a dividend higher than the average found in the S&P 500. The strategy looks to include high quality companies that have a high probability of continually growing dividends that are paid to shareholders. Earnings stability and future earnings prospects are reviewed for dividend payment stability and potential for long-term capital appreciation. In addition to strong fundamentals, the portfolio also wants to hold those dividend paying stocks that are more technically favorable with positive relative strength as compared to other dividend paying stocks. The S&P 500 is divided into multiple sectors. Each of these sectors historically performs better or worse within certain stages of market cycles. The S&P 500 typically over-weights or under-weights each sector based on past successes or failures, which may increase volatility and lower returns with index funds. Equity Growth and Value’s goal is to identify and purchase leading individual stocks within these sectors and to minimize short-term gains by potentially holding each position for 1 year. Equity Growth and Value’s goal is to identify and purchase individual stocks within these nine sectors and to minimize short-term gains by potentially holding each position for 1 year. The entire Portfolio Management Team has been intact together for over 10 years at Churchill Management Group and some together since 1969. Our Team collectively has over 150 years of experience using our disciplined and effective investment approach. Our employees are based in most major regions of the country to provide full service Client support.